﻿ Long term update: Missing you already! Long term update: Missing you already! Where did that year go? One minute I'm waiting for the arrival of the Honda VFR800X Crossrunner, and the next I’m giving it a wash and brush up ready for it to go back to Honda. When it did arrive I had an element of trepidation over whether this was the bike for me. 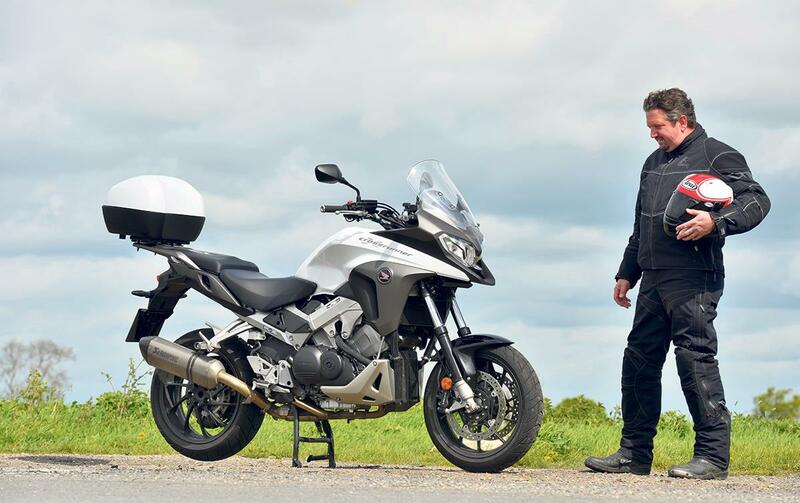 It falls in between a tourer and adventure bike and, even though Honda promote it as an adventure bike, I felt it was neither and wondered what it actually was. Although from my experience I would not advise you to take it off road; I went down a green lane for a photoshoot once and found myself wrestling the Crossrunner all the way — not good! As a day-to-day bike it excels. In the 11 months and 8000 miles we’ve spent together the Crossrunner has really proved itself. I’ve racked lots of miles on my daily commute to MCN headquarters, which is a round trip of 26 miles, in all weathers, and the quality of the Honda’s build has shone out, especially after enduring the wet and salty roads throughout the winter. When I’d finished the final clean prior to its return I was suitably impressed. Once the road grime was removed it revealed all the different finishes still looking as good as new, with only a little tarnishing on the odd hose clip. One of my favourite things about the Crossrunner is the riding position; it’s got a real command-post feel about it, like you get when riding a big traillie. Sitting very upright with legs slightly swept back, and the wide bars make for a very comfortable ride. This position also works well for riding two-up. I took my dad all over the Lake District on the back and, for someone who has spent his life riding motorcycles for a living, he was a good candidate to put to the test. He was most impressed with the Honda’s comfort, even though like most riders he prefers to be on the front. What really makes the Crossrunner stand out is the V4 engine, which has enough grunt to take off like a rocket, while also being beautifully smooth. The only thing that takes a bit of getting used to is the VTEC system. The first time I experienced it was on a VFR800 and it came as a bit of a shock, but after a year of riding the Crossrunner it’s now just the norm. In the 8000 miles I have done the engine has never faltered, and is only just coming up for its second service (the first was at 600 miles). One little detail I have noticed, but not found anything written about, is the anti-stall feature. I discovered this when I was sat at a red light for a ridiculously long time, and as I released the clutch towards its biting point I noticed that the revs crept up as I let it out — a nice touch. The Crossrunner package I was supplied came with a topbox, TomTom sat-nav, Akrapovic exhaust can and quickshifter. The topbox makes a great practical addition and I also added a pair of Honda panniers, which have made it uber practical. Whether touring or just going shopping at the weekend, there is stacks of room.So back to my original question at the beginning ‘what precisely is it?’ I will tell you what it is — it’s brilliant, a really good all-rounder that has put a smile on my face. Well done Honda!